This post is already two weeks late so lets get down to business! 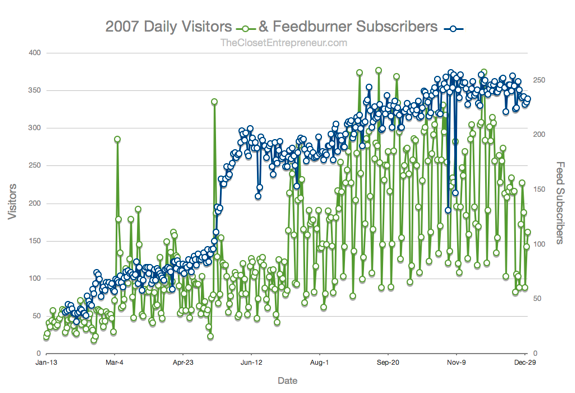 First of all, I just wanted to thank everyone who was kind enough to subscribe to this blog in 2007! Either 1) you hit the subscribe button by accident, 2) my incessant begging broke you down, or 3) you genuinely found my posts useful. In all seriousness though, it means a lot to me and definitely keeps me wanting to share the love when it comes to entrepreneurship, productivity tips, and business advice. 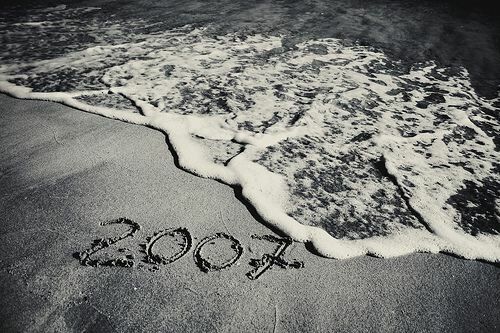 Second, I wanted to send out a big THANK YOU to all the individuals who left comments in 2007! A blog without comments is like a Bollywood movie without a 6-minute dance, it’s just not fun. Here’s wishing you all a belated Happy New Year and thank you again for all your continued support and readership! It’s pretty incredible to see what a link from a great blog like Dumb Little Man (58,000 subscribers) can do for your blog, that’s the spike of traffic and subscribers seen on May 16. Two other notable traffic spikes occurred on March 6th when Wendy Piersall from eMoms at Home submitted my Did You Know Remix to StumbleUpon (Thanks Wendy! ), and July 11th when Google started sending traffic my way for the search term farewell letter after I posted a funny email I received. 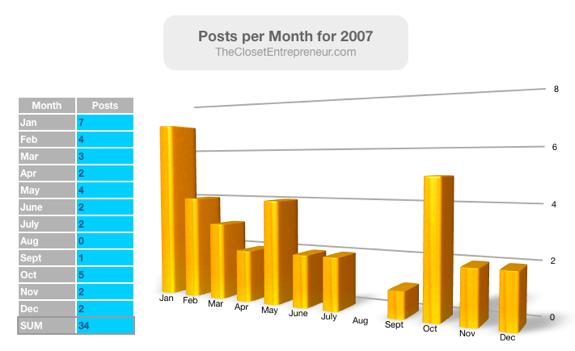 One very important thing the chart doesn’t tell you is how much help this blog has received from Brainfuel.tv which accounts for the second most referrals to this blog – thanks a million Chris! And just like the government, there are various behind the scenes activities that have made this blog a bit more enjoyable like the advice from Chris Garrett’s Killer Flagship Content EBook and all the articles from the great blogs I read on a continuous basis. As the saying goes, if it ain’t broke, don’t break it! Tutorials get the most conversations going, and I’m basically looking to turn this entire blog into a tutorial for helping others become an entrepreneur while working in a 9 to 5 world. My initial intent was to just share my story but then what fun would that be? As I alluded to above, 2008 will feature more advice/tips/diy/tutorials on entrepreneurship along with more inspirational/self-motivational paraphernalia since I’ve found that becoming an entrepreneur is as much about doing as it is about believing in and envisioning things getting done. I’ll refrain from making any New Year’s resolutions for this blog, yet my goal has always been to help out others in any way I can so now it’s your turn to speak – what do you want to see in 2008 from this blog and for yourself? Just leave a comment below! Great graphs! 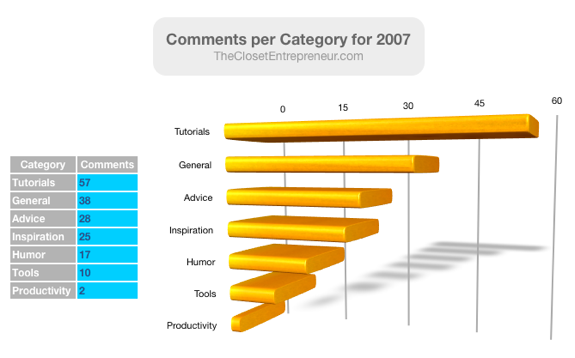 I found the Category vs Comments graph to be very interesting. I wonder how the traffic on those categories compared, though. Hey Brian, glad you liked the graphs! It’s the first time I actually put iWork’s Numbers ’08 through its paces and was very pleased with the results. Unfortunately, the software struggled a bit when generating 3D graphs with lots of data, yet it’s not bad for a first revision. 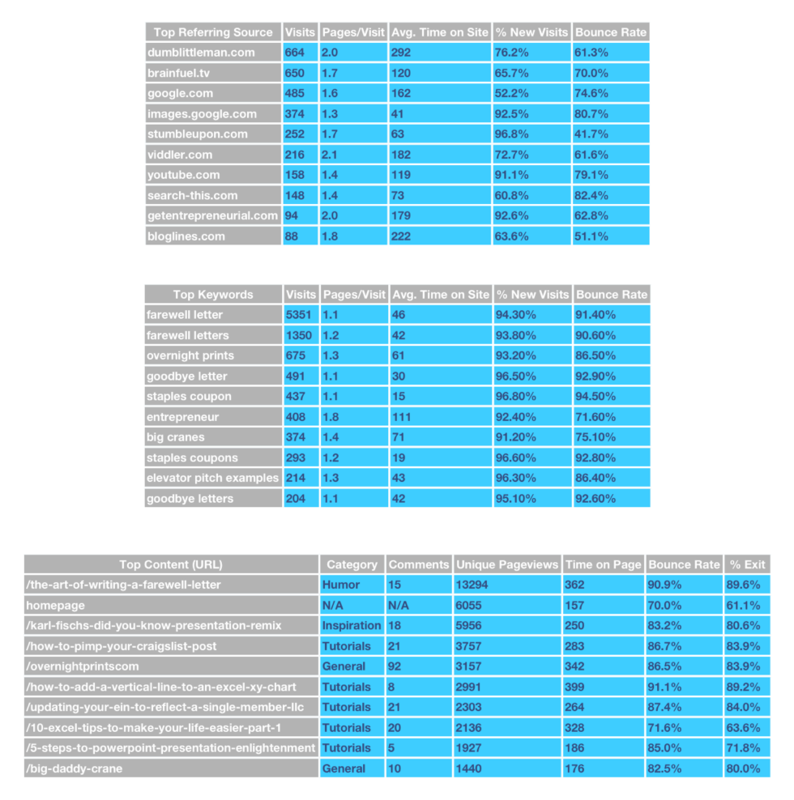 As for category by traffic, the Tutorials category gets a decent amount of traffic but none of the posts rank very high on Google search results. The farewell letter post ranks second or third on Google search results and helps put the Humor category in the top spot for traffic. So yes, when compared by traffic numbers the results are a bit different. Wow, I’m amazed that BrainFuel sends so much traffic. That’s great! Excellent blog Tomas. Keep it up! Yeah, Brainfuel was only a few referrals from taking the top spot! Thanks for the kudos Chris, and wish Brainfuel, Tornado, Track the Time, and Arizona Coffee all the best in 2008!